Our team of SEO and Content Marketing experts will take your business needs into consideration and will help you create a premium eBook that will maximize your lead-generation strategy, targeting your Ideal Customers. After an initial briefing with our dedicated Client Success Manager, our Digital Marketing experts will conduct an in-depth SEO and Content Marketing Analysis and conclude to the most valuable topic and keywords you should focus on in order to meet your business objectives. Then, we will provide you with 8 SEO-optimized chapter titles in order for you to produce the content of your eBook. 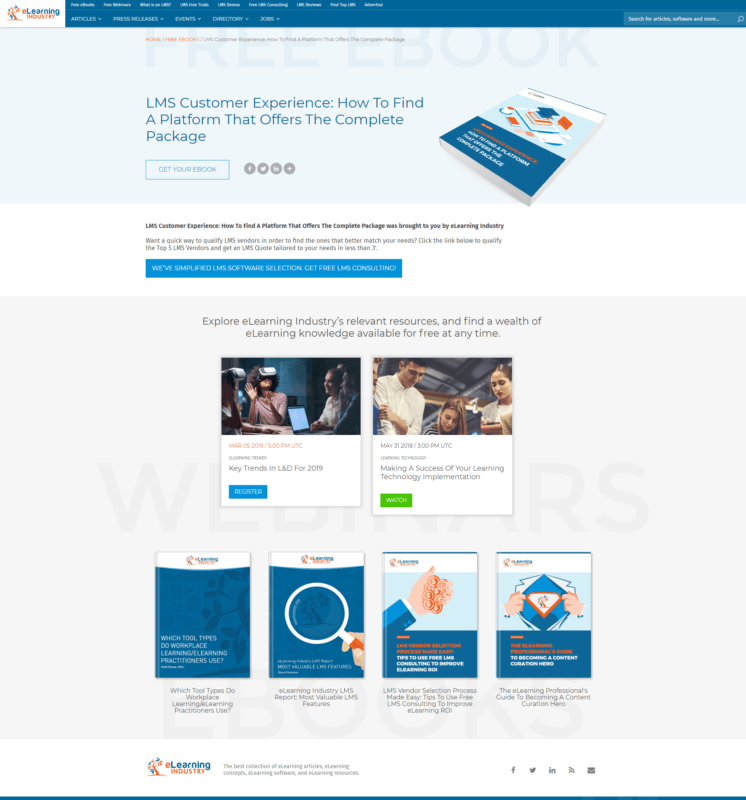 When you complete the content creation, we will create a specific landing page for your eBook and we will start collecting leads on your behalf. Our Digital Marketing team will work on a complete promotional campaign using social media and email marketing among others. In addition, the chapters of your eBook will be published as independent articles on eLearning Industry, including links that point back to your eBook, in order to drive traffic to your eBook’s landing page. Thus, your eBook landing page and its supportive articles will get a high volume of organic traffic that will help your lead generation process. Create a unique eBook with the guidance of our team of experts. Get out of the content chaos, and discover what your audience cares to read about. Generate new leads every time an eLearning professional downloads your eBook. Build thought leadership by tailoring the content to your audience’s specific needs. Access full lead details anytime for free, for a period of 6 months after publishing your eBook campaign. Book a 1-hour 'discovery call' with our Client Success Manager in order to help us understand your business needs & objectives. Create the content of the chapters, based on the given editorial calendar. We expect from you to write the specific chapters within the next 6 weeks. Develop the eBook (a PDF file) according to the suggested outline. Chapters of your eBook will be published as independent articles on eLearning Industry including links that point back to your eBook. We will host your eBook on a specific landing page to help it to collect leads. Our Digital Marketing team will start a complete promotional campaign through our social media channels, newsletters and thank-you pages among others. You can access your leads’ data anytime, as long as your premium eBook campaign on eLearning Industry is active. In order to be able to get complete lead information, both parties (your company and eLearning Industry) have to sign a Data Processing Agreement (DPA). Your campaign will start counting directly after we create the eBook’s landing page on eLearning Industry, the duration of which is 6 months. After the 6-month period has come to an end, your subscription will be renewed automatically for 6 more months at the cost of $1200, unless you have already canceled your subscription.